Eritrea became an Italian colony in 1890, and Ethiopia became an Italian colony in the 1930s. Ethiopia gained it's independence after World War II, and Eritrea was given to Ethiopia with the expectations that Eritrea would have it's own authority and legislature. However, Ethiopia dissolved the government and banned Tigrinya (Eritrea's major language). Eritrea launched into a civil war with Ethiopia, spanning 30 years and causing over 1/2 a million Eritreans to flee. The war began in 1961, and ended in 1991. The Eritrean rebels won, and two years later, they became their own country. But only after five years of peace, the war flared over disputing border lines. Eritrea and Ethiopia both cited treaties made with Italy when it was in control. In 2000, Ethiopia defeated Eritrea, and took the disputed lands for it's own. 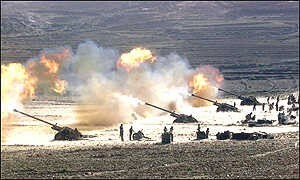 A picture of the war over boundries. 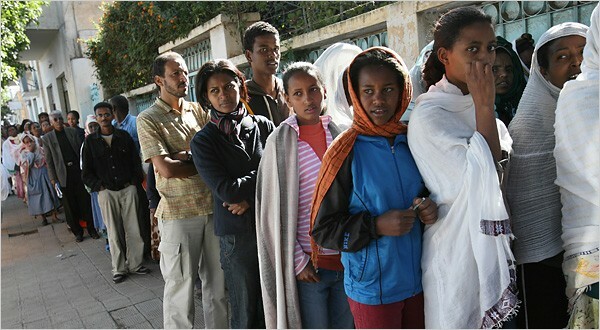 Taken in 2007, this picture shows a bread line, before another war with Ethiopia over borders. From the late 1800s-mid 1990s, Ethiopia was in control of the Amharas, a group of Christians. The government was overthrown in the early 1990s, and power was divided among a number of Ethinic groups. Oromos, southern Muslim fundamentalists, are the largest group, with almost 50% of the population. Tigres live in the north, where the Ethiopian Orthodox Church was born. Teh Amahara banned everything about these cultures when it was in power, from language to religion.